Harvest Park is an Award Winning Middle School located in Northern California’s East Bay. A California Distinguished School 1994, 2001, 2005 and 2013! These awards were earned in part by the outstanding and collaborative work of our school’s teachers, staff, administration, parents, students and community members. Since it’s inception in 1970, Harvest Park has had several school site Principals. As part of our historical page, we wanted to share the list of Principals from Harvest Park, as well as a short an excerpt about HPMS that was written by author, Jerry Pantage-Long in 1989. We hope you enjoy learning more about our school history! Written By Jerri Pantage-Long in, “Echoes of School Bells: A History of Amador-Pleasanton Public Schools 1964-1988.” The book was written in 1989. “Harvest Park” was “planted” in the middle of what had been an agricultural area that produced bountiful harvests of tomatoes, cucumbers, corn, and sugar beets for generations of local families. Harvest Park Middle School opened in 1968. 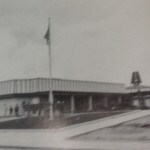 Some 30 years later, that same spirit of goodwill and cooperation between the city and the school district allowed our school to acquire a full-size gymnasium, jointly funded by the two public agencies. Our gymnasium is equipped with double locker rooms – one set for students’ use during the daytime, the other for community use nights and weekends as part of the city’s recreation program for youth and adults. By its very name, Harvest Park Middle School reflects another important part of the history of Pleasanton, California. The actual Harvest Park is a tree-shaded open space between our middle school and our next-door neighbor, Walnut Grove Elementary. Pleasanton Unified School District and Pleasanton City Council worked closely together to plan public parks near as many local schools as possible. Pleasanton is a community that has valued public education throughout its history. That fact was reaffirmed when community members passed bond measures that enabled us to completely remodel and upgrade our facility, making it more people-friendly. So-called “open pod” classrooms that had been an experiment of the 1960’s were enclosed to decrease noise from adjacent classrooms. Windows were added to bring in more natural light. Coverings over walkways and the lunch area make it easier for students to get from class to class and enjoy their lunch breaks in any kind of weather. Every classroom was updated with new wall coverings and a locally designed “teaching wall,” which combines whiteboards with covered storage. Our school’s classrooms surround an open area on campus with an amphitheater on the south side. By special design, we have a multi-purpose room with a roll-up door that can switch onstage programs from being focused indoors to being presented to an audience seated in the amphitheater. However, state research concluded that students were better served if they had three years of middle school rather than two years of intermediate school. Middle schools offer students more time to transition from single-teacher classrooms of elementary school to multiple teachers in high school. Middle school also provides students with the opportunity to sample many electives, thereby being better prepared to choose high school programs that meet their needs, interests, and future plans. Harvest Park has continued as a middle school, serving as many as 1,150 students each year. Harvest Park has served sixth-, seventh- and eighth-grade students for most of its existence. 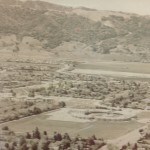 Previously, students in those grades had attended the original Pleasanton School, a kindergarten-through-eighth-grade school on the site of the current school district office. However, there was period in the 1980’s when enrollment dipped, the original Pleasanton School was closed, and local elementary schools had room to serve kindergarten through sixth-grade students from their attendance areas. For a few years, every seventh- and eighth-grade student in Pleasanton attended Harvest Park, then called an intermediate school. When Harvest Park Middle School was opened, its mascot was the Crusader. During its years as an intermediate school, the mascot became the Warrior. In 2003, our mascot was changed to the Patriot, with Ernie the American Eagle being the incarnation of that theme. Our school is proud to have its own television studio, from which students can broadcast daily announcements, campaign speeches, and other programs into every classroom. A popular feature of the daily broadcast is a conversation between puppets Character Ed & Edwina, who use humor to reinforce our community’s character traits known at Harvest Park as the CHRRIS characteristics of Compassion, Honesty, Respect, Responsibility, Integrity, and Self-Discipline. In addition to television production, students can choose from electives that include world language (Spanish and French), instrumental and choral music, drama, home economics, leadership, Service learning, computers, and art. We are proud that Harvest Park Middle School has earned the coveted National Blue Ribbon School, California Distinguished School and National School of Character Designations. Our students and dedicated staff members also share pride in our Annual Performance Index (API) Score, which is above 900. More than a decade ago, our campus became locker-free, replacing the need for students to carry their textbooks back and forth by giving students a set to keep at home and having a second set in the classroom for their use at school. Every teacher has a computer, most have document cameras, and the D Building has been equipped with ceiling-mounted LED projectors. The entire school is wireless. During the 2009-10 school year, the library computer system was updated, allowing students to look up books and do research online. Harvest Park Middle School pioneered the use of laptop computers for students’ reading and writing assignments. This began as a voluntary program involving a few students in 2003, but since has grown to include about 30% of our student body. The use of this technology has enhanced our students’ skills in research, revision of first-draft writing, and communicating with teachers in a timely fashion. Houses and streets now cover the blocks around our school. Instead of vegetable crops, Harvest Park Middle School now proudly produces “crops” of students well prepared to succeed in high school, and beyond.